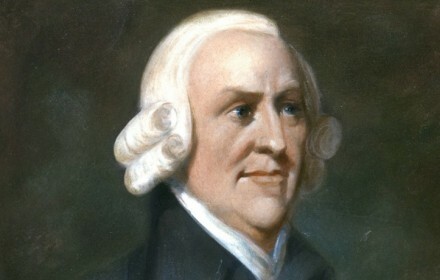 A major driving force of The Scottish Enlightenment, Adam Smith is generally viewed as “The Father of Modern Economics,” and his work remains influential to this day. Born in Kirkaldy, Scotland, Smith’s father died while he was still an infant and he was raised by his widowed mother. Despite the hardships of 18th century life (Smith was kidnapped by Gypsies when he was three), he excelled beyond the measure of his peers and is known for two verifiably great works: The Theory of Moral Sentiments(1759), and An Inquiry into the Nature and Causes of the Wealth of Nations(1776). While both tomes are worthy of being read, the latter (usually referred to as The Wealth of Nations) is of particular interest for those interested in free market economics.